Enter the Pro-Assistant Championship Now! 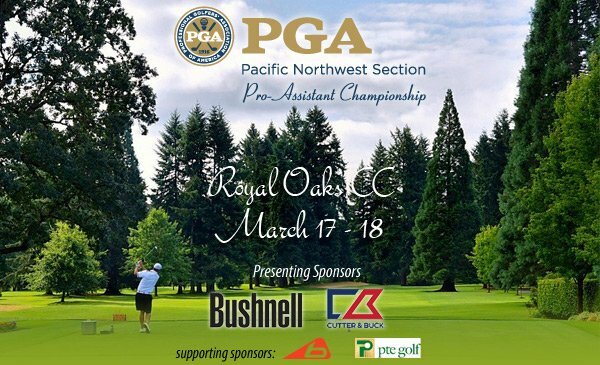 Entries are now available for the PNW PGA Pro-Assistant Championship at Royal Oaks CC on March 17-18th. Head PGA Professional Scott Leritz is excited to host this year and invites you to join us for both the tournament and our Spring General Meeting which will immediately follow our first round at 7:00 pm. You are all invited to attend. Dress attire for the meeting is golf attire but it is okay to wear a jacket! Bushnell and Cutter & Buck are returning with Rep’s Sally Schmitz and Bryan Dickson as Presenting Sponsors. Bolle’ and PTE Golf are being added as Supporting Sponsors. Thank you! The Pacific Northwest Pro-Assistant Championship launched into the tournament world in 1992 with a seven hole sudden-death match between the Progress Downs team of Jerry Minor/Ralph West and the Royal Oaks team of Steve Bowen/Michael Wilkerson with the Progress Downs’ team being victorious. Last year, the team from Columbia Edgewater CC (and 2006 champions) with Head PGA Professional Bryan Tunstill and Assistant PGA Professional Adrian Burtner won the Pro-Assistant Championship by two strokes over defending champions Head PGA Professional Brent Murray and Assistant PGA Professional Scott Erdmann from Oswego Lake CC after posting rounds of 65-67-132 at Overlake G&CC. View past Champions of the Pro-Assistant Championship. Royal Oaks has always been known as a long, tough tree-lined golf course. It is a popular tournament site and has hosted many major Northwest tournaments. Royal Oaks has been consistently ranked in the top 5 golf courses in the state of Washington, and has also been ranked in the top 100 nationally by Golf Digest Magazine. Sally Schmitz is back as a sponsor of the Pro-Assistant Championship with Bushnell. Bushnell has been the industry leader in high performance sports optics for over 50 years while offering cutting edge technology on a wide array of rangefinders. We hope to see you at the Pro-Assistant Championship and our General Meeting at Royal Oaks CC next month!